Anyone who enjoys time in the Scottish hills would have been saddened and sobered by the tragic accident in Glencoe when three climbers lost their lives in an avalanche.Your thoughts inevitably turn to the families of those who lost their lives and the tragic news they are coming to terms with. I have also been thinking of those in the Glencoe Mountain Rescue team and the other emergency services who were called to Coire na Tulaich on Buachaille Etive Mor. Living in a small community not far from Glencoe, I know many of the people that would have been called out as part of the rescue effort. However focused and professional these individuals are, they must be effected by callouts like these, where they realise that despite their best efforts perhaps their is little they can do once they arrive on the scene. These guys really do deserve our respect. Surprisingly, the news coverage over the weekend has been balanced and considered. The reports emphasised that there were significant avalanche warnings for the area but also that these were experienced climbers that would have understood the inherent risks and the personal responsibility involved. John Grieve, the leader of Glencoe Mountain Rescue, summed it up by saying that yes there were warnings but that they were not in the business of stopping people from going out on the hills. I have been dipping in to the excellent book about Birds of Prey, in the New Naturalists series. 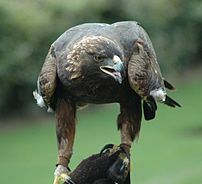 Amazingly, due to the magnification ability of a Golden Eagle’s eyes, if it was flying 1500 feet above the summit of Ben Nevis it would be able to see a cat in a garden in Inverlochy! Just as well Felix domesticus is not on the list of preferred delicacies for a Golden Eagle. Do you ever wonder why we set foot on the hills? I thought this quote sums up the reason.